Yarn is sold by weight or by length, but these days I prefer to think of skeins in terms of minutes of time invested. Each yard of finished, 2-ply yarn took me 2.1 minutes to spin (including spinning both singles and plying them together). Yarn for the show. Actually, not everything in this basket is for sale, it’s even less than it looks like. I managed to spin 1515 yards of yarn for the show, even with my broken finger. That basket of yarn represents 53 hours of work. I guess that explains why weeds are taking over my garden and the dog is feeling a little unloved. This entry was posted in fiber art and tagged hand spinning, hand spun yarn, handspinning, handspun yarn, yarn. Bookmark the permalink. How interesting. How do you measure the length of your yarn? Do you have a special tool or method for doing it? I usually work mine out by weight. 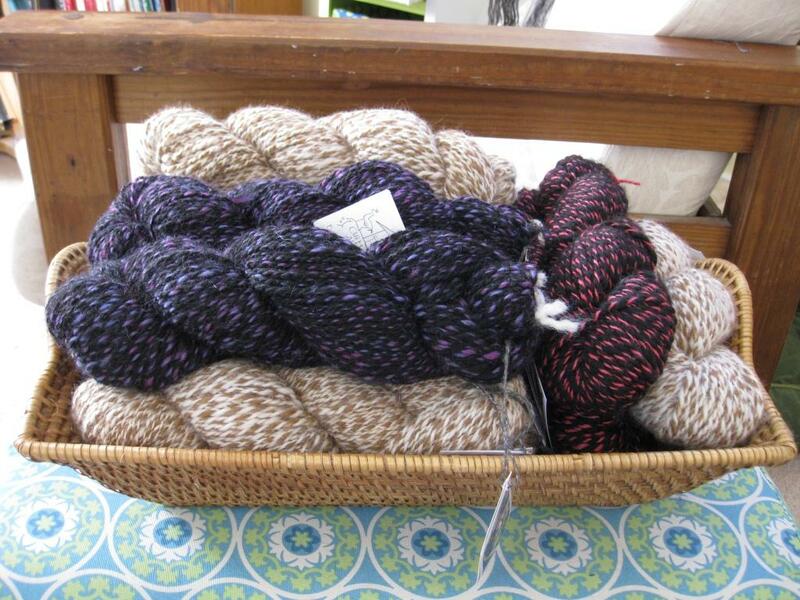 Each skein I make weighs approximately 110 gms. I try to keep it as close to that as possible. I usually spin two spools of yarn and fill them as much as possible to the edge of the spool at the smallest end, but not more than that. That way I have a yardstick to getting the two spools as similar as possible. Then I ply them together, skein and weigh. I finished a skein the other day and it’s now waiting to be weighed. How much do your skeins weigh and how much will you sell them for? It’s very interesting that you measured the time it took you to spin them. I ought to try that as well.